Monday – Friday 7:30 a.m. to 4:30 p.m.
Hills Park is located on the very North end of Sheldon, just west off 2nd Avenue. The park features 26 campsites, equipped with electrical and water hookups at each site. All electrical sites have 40 AMP-220 VOLT, 30 AMP-110 VOLT, and 20 AMP-110 VOLT. A RV dump station, restrooms, playground equipment, picnic shelters, and grils are available. Payments: RV Camping is $15 per night, and tent camping is $10 per night. Payment envelopes are available at the kiosk. Fill out information pertaining to your stay. Once complete put cash or check into envelope, and then put the completed envelope into the drop box. A Sheldon Park Staff will check daily to verify your stay. All campsites are a first come, first serve basis. No reservations are taken. The park, unique for it’s trees, hills, and open green space, is a popular place for hiking, picnicking and family activities. There is a 9 hole frisbee golf course with cement pads for your entertainment as well. The Sheldon City Park is located between 4th and 6th Avenues just south of Highway 18. The park features include a shelter house, restrooms, picnic tables, grills, softball fields, basketball court, open air picnic shelters, sand volleyball court, and a covered gazebo. 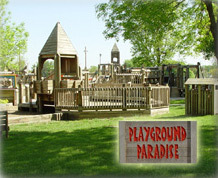 The City Park is also home to Playground Paradise, a climbing and exploring adventure for children. 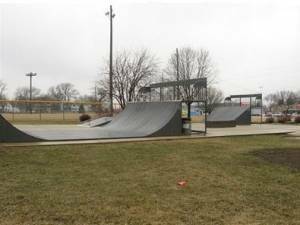 The newest attraction to the park is Skate Park, popular for skate boarding and rollerblading, is located on the Northeast corner of the park. *Prices include $20.00 deposit to be refunded following acceptable cleanup and a $10.00 key deposit. ** Shelter house has a sink, broom and dust pan for clean up. No refrigerator, stove or cooking facilities. Please contact the City Office at (712) 324-4651 with any questions about reservations for the shelter house. No alcohol is allowed in city parks. Schemper Park is Sheldon’s newest park, it is located in the Schemper Addition on the corner of 9th Street and 25th Avenue. The playground equipment is very popular and features a spring swing. Sunrise Park is located in Northeast Sheldon. Follow Highway 18 East to 18th Avenue then turn North. It is at the far North end of 18th Avenue. The park features a covered picnic shelter, swings, and a small pond. 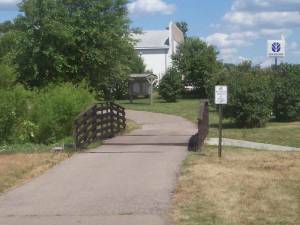 Sunrise Park is a great place to get on the eastern leg of the Sheldon Recreational Trail. Thorman Park is located on Thorman Avenue between 15th and 16th Avenues in Southeast Sheldon. The park features picnic shelter, swings, a slide and playground equipment. Sheldon is making an effort to enhance the community with green spaces and trails. Our citizens look to the outdoors for safe, healthy and affordable recreation opportunities. Approximately six miles of asphalt trail accommodate bikers, hikers, and inline skaters during the summer months. It is possible for senior citizens and individuals with physical disabilities to enjoy the trail using a golf cart with a city permit. The Sheldon Recreational Trail has constructed a trailhead arch signifying the entrance. It is located in Hills Park, a location beneficial to campers, visitors, and all community members. Using 3,245 bricks salvaged from the Sheldon High School and Jr. College, the trailhead will honor organizations, businesses, and individuals who have made significant contributions and easements to make the trail possible. Trail enhancements include picnic and rest areas, restrooms, prairie restoration area, playgrounds, wildflowers, trees, berms, prairie grasses, wildlife and birds. community creating biking and walking paths to acces the community college, parks, public schools, Village Northwest, senior living centers, swimming pools, etc. Families come first in Sheldon – the trail is for children of all ages! Tennis and Basketball courts located behind the high school, 1700 East 4th Street, offers five tennis courts and one full-length basketball court for you enjoyment. The courts have a lighting system for activities taking place after dark. Youth tennis programs and 3 on 3 basketball leagues take place at this site during the summer. All vendors at a Sheldon Park must have approval by the Sheldon Park and Recreation Board to sell food, beverages, merchandise, and any non-related park activities.